The AEM archive stands out for its historical interest, quality and sheer size. To exhibit the full extent of the material, studio AR.CH.IT Luca Cipelletti devised a series of video installations. The strategy animating these installations opens the show to different readings. It achieves this goal by offering a series of diverse itineraries and by taking as a reference point the ceiling that Giovanni Muzio designed for the Triennale Building. A complex graphic animation apparatus presents the whole exhibition in a dynamic loop establishing a compelling rhythm to engage visitors. At the core of the exhibition a video installation displays the energy grid starting from the hydroelectric plant as it spreads into the city of Milan. The installation consists of a vertical projection on a three dimensional laser-cut table shaped like the Valtellina Valley with Milan at its center. The 3D model used to create the table was also used to make the projected video: with the virtual replica of the table it became possible to provide different lighting schemes and project them from the ceiling, thus generating a real-time topographic map. Around the whole room a “panopticon” video system was used, a “scenographic hat” with diverse display functions. Capable of bringing together diverse themes, images and contents, this feature of the show served as the “engine” driving its rhythm. 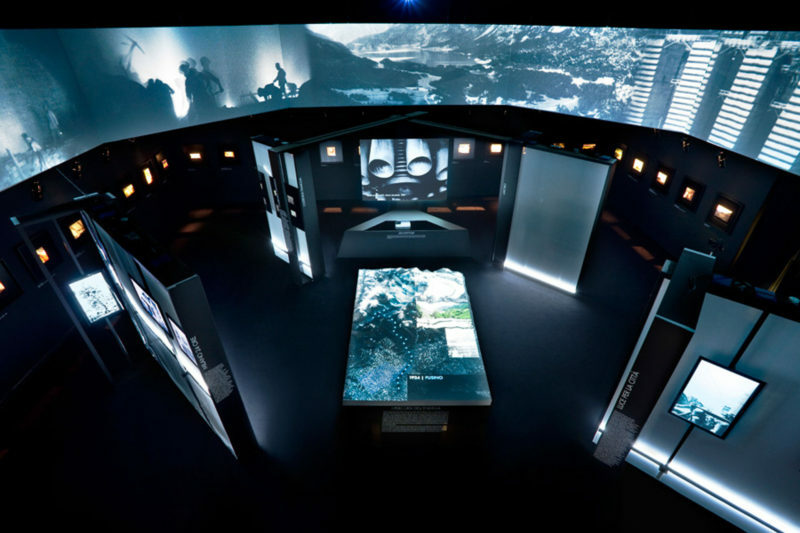 The content of the exhibition is made up of various historic videos from the archive shot and rotated 360°. The different films were “stretched” between frames to produce a dynamic video effect that offers the option of static or moving images of energy flows as they make their way through the city.